HUNTINGTON, W.Va. — Closer, but not quite there just yet. 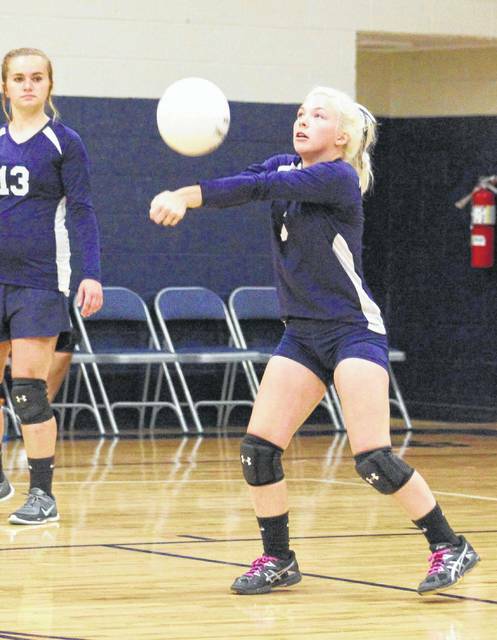 The Hannan volleyball team remained winless, yet put together four quality games on Thursday night during a pair of losses to Covenant and host Huntington Saint Joseph in a tri-match in Cabell County. The Lady Cats (0-5) dropped a 25-15, 25-21 decision to Covenant in the opening match, then fell 25-17, 25-19 in the finale against the Lady Irish. HHS jumped out to early leads of 3-1 and 6-2 in Game 1 against Covenant, but the Lady Warriors answered with seven straight points to build a 9-6 cushion. The Lady Cats rallied back with three points to knot things up, but Covenant reeled off 12 of the next 13 points for a sizable 21-10 edge. Hannan cut the deficit down to 21-15, but Covenant scored the final four points en route to a 1-0 match advantage. The Lady Warriors stormed out to leads of 7-0 and 16-9 in Game 2, but the Lady Cats responded by twice pulling to within three points at 23-20 and 24-21. Covenant, however, broke serve to score the final point of the match and claim a straight-game decision. Kassidee Bush led the HHS service attack with seven points, followed by McKenzie McQueen and Jessica Dalton with five points apiece. Halie Johnson and Josie McCoy also added four points and one point, respectively. Hannan never trailed by more than eight points in its match against St. Joe as the guests built early leads of 3-1, 6-5 and 10-9. The Lady Flyers, however, reeled off seven straight points for a 16-10 lead and never looked back. The Lady Cats twice closed to within four at 20-16 and 21-17, but Huntington St. Joe tacked on the final four points for a eight-point win. Hannan led only once in Game 2, at 3-2, but the guests kept the score around three points for most of the finale. Leading 22-19, the Lady Irish scored the final three points to wrap up the 2-0 match decision. Dalton led the Lady Cats with six service points, followed by McQueen with four points. McCoy, Bush and Cassidy Duffer each tacked on two points, while Halie Johnson completed the scoring with one point. Hannan returns to action Tuesday when it hosts Van at 6 p.m.
Hannan senior Jessica Dalton bumps a ball in the air during an Aug. 30 volleyball match against Wahama in Ashton, W.Va.